This Sunday I gave a talk at the Unitarian Universalist Church in Pittsfield about how to get the healthiest value for your food dollar. Here is most of the talk, with links to all kinds of resources to help you follow through with any suggestion that sounds good to you, here’s to eating well and saving money! Choosing to make the healthiest use of your food dollar involves more than just economics and saving money. For me, making healthy choices means thinking about my environmental impact, supporting our community and nurturing my family. So the options and suggestions I am going to talk about here take all of those things into consideration. And what’s great is that a holistic approach to food shopping where we choose what’s best for mother earth, for our families and community is so often what’s best for our bodies as well. Getting high nutritional value for a low-cost involves doing more yourself and relying less on packaged or prepared foods which are generally expensive in terms of your health, your budget and also create a lot of waste. It does not mean you have to quit your job to make everything from scratch, although there’s nothing wrong with that! It may mean managing your time a little differently or shopping at different stores and using your same food budget in a new way. High value for low-cost may also involve getting together with friends and family to do things like cooking meals together, preserving a lot food all at once or spending time at a community garden like the one at Canoe Meadows off of Williams Street. Plants are a great place to start as far as a getting a whole lot of nutrition for very little money. Remember: the more processed and packaged a food is the more you are paying for the packaging and the preparation and the less actual food you get for your money. The following tips, separated by food type, contain links to resources to help you follow through with making some money-saving, health building changes. 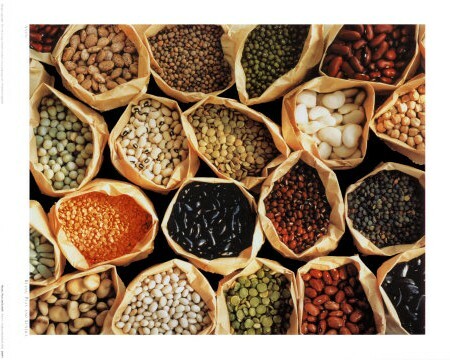 Beans: Soy beans to navy beans and every legume in between offer high protein, high fiber for penny’s per pound. I am talking about organic dried beans, or canned, if you are in a hurry. Yes, they need to be soaked overnight and cooked for a while in on the stove top: a pressure cooker will cut cooking time down by hours! All it takes is a minute to measure beans and leave them to soak overnight. Another couple of minutes to rinse them, add water and set them to cook in a pressure cooker or in a crock pot, with the timer on. Cooking a large pot of plain beans means you have many servings of nutritious protein for a minimal time and money investment. Beans can be baked into burgers, added to soups and salads or served as a main course. I have even make brownies with beans! Soy: I would recommend avoiding processed soy foods and sticking with organic, non genetically modified tofu and tempeh, which is a fermented soy food made from whole soy beans. 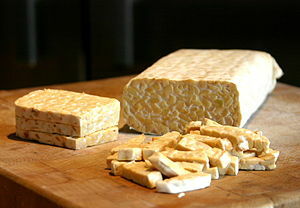 Tempeh is really delicious and the easiest to digest of all the soy foods. Processed soy is expensive and usually has a lot of stuff added to it, things we (thankfully!) don’t have access to in our home kitchens. I call things like soy ‘chicken’ nuggets, soy ‘meat’ and soy cheese vegetarian junk food. Tofu and tempeh are minimally processed and less expensive. Just like with your pot of beans you can season them however you like, from breakfast smoothies to cakes, scrambles and stir fry’s! I am definitely making a case here for home cooking that starts with whole foods. When you make your own food from simple ingredients you have lovingly made food that is much less expensive and you know exactly what you are eating. Cooking at home is the best way to avoid additives, chemicals and other unhealthy stuff getting from into your food. You have control when you prepare your own food and you save money. Bulk cooking is an excellent time saver. Make a big pot of chili (or soup or similar one dish meal) with lots of beans and veggies and you have dinner, plus leftovers and you can freeze half of it for another meal later in the month. Set aside an hour or two once or twice a week, you will be able to prepare and cook a lot of food all at once and will have plenty of healthy options on hand throughout the week. Buying in bulk is another money saver: you don’t pay for packaging, just the food! There is a buying club at the Unitarian Church as well as one through the Berkshire Co-op market in Great Barrington. Hopefully there will soon a food co-op in downtown Pittsfield, the first organizational meeting is today, Wednesday at 6:30 at the Unitarian Church! When I buy in bulk from the Barrington Co-op I pay only 15% above whole sale on everything from nuts and tea to spices, grains, beans and even dairy and produce. And it’s all organic. Herbs and spices are your friends: they add health benefits, are high in nutrients and can transform a plan serving of beans, grains or tofu into a gourmet meal. If you have a sunny windowsill you can have free herbs year round for the low investment of a couple of seed packets and a few pots of dirt. Spices can be bought in bulk for much less than the small glass jars at the grocery store. Animal Protein: It’s 100% worth the investment to buy locally raised, healthy animal foods than it is to use that same $20 to buy a lot of cheap meat and dairy. I think it was Michael Pollan who said there is nothing more expensive than cheap food. We all heard about pink slime, right? Cheap food is making Americans fat and sick, check it out the next time you are in the grocery store: diabetes and obesity are always on sale. Factory farms, where all cheap animal foods come from, are not only incredibly destructive to our environment but also inhumane and cruel to the animals and workers. These animals are full of pesticides, thank you Monsanto, drugs and misery, you don’t want to put that into your body or feed that to your children. Take your meat and dairy budget and invest it in sustainably raised fish, locally raised happy meat and dairy and supplement the rest of your diet with plant-based foods like beans, whole grains and soy. Remember when meat was a special occasion, once or twice a week? It should be! Eating too much meat can be unhealthy, it’s especially bad for those with arthritis and can make you tired and lethargic, among other things. We all know the Perdue guy, doesn’t he look like an unhealthy chicken? We truly are what we eat! 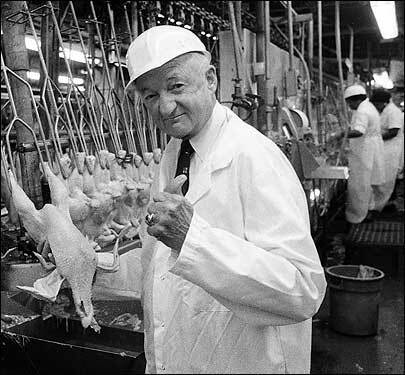 I drove by one of the Perdue factories in Virginia last week and the smell from the highway was awful. This is not food. We need to remember what we are eating; that an animal has contributed to the life cycle of the farm (if it’s raised on a real farm, not in a factory) and has ultimately given its life so that we can thrive. Another awesome budget protein source are eggs. I think every house should have a couple of back yard chickens. Are your kids bugging you for a pet? 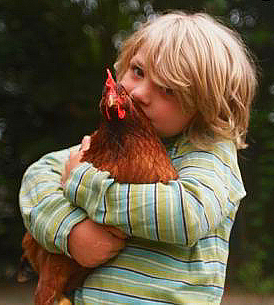 Chickens are a pet that really pull their own weight; they pay you back with free food! They eat all your veggie scraps and turn them into beautiful little orbs of easy to digest protein that you can make so many different things with. If you have chickens, after the initial investment of building a coop, you’ve got free organic protein in your backyard, it doesn’t get better than that. When it comes to carbohydrates whole grains are where it’s at as far as affordability and health. Bread, crackers, cereal, pasta: you are paying a lot for processed wheat and water. Read ‘Wheat Belly’ if you want the truth about why wheat, the way we cultivate it in the US, is making so many of us overweight and unhealthy. 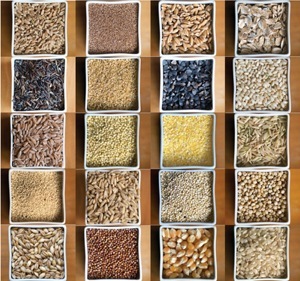 With whole grains there are so many options to choose from: quinoa, millet, barley, brown rice, oats. Just like with the dried beans, you can make a whole bunch of grain at once and have meals for days. Plain grain can be turned into yummy breakfast porridge, added to a cold salad or reheated with olive oil and a few herbs and spices to round out a healthy dinner. If you buy, for example, boxed breakfast cereal , you are paying a lot for a cardboard box full of refined carbohydrates and sugars. Take that same 5 dollars and you will be amazed how much organic rice and oats you can buy. Grains are a versatile, healthy and affordable staple, get creative and see what you can make! Fresh produce, especially organic produce, can add up, I know. That’s why it’s so important to make bulk grains and beans a staple of your diet, you will have money left over to buy the slightly more expensive organic produce. Did you know that conventional produce has lost up to 50% of its nutrients over the past 50 years? It might be a dollar or two less to buy conventional but you are getting half the nutrition plus all the pesticides and herbicides that cause cancer and all manner of disease not just in humans but in the environment as well. Organic produce is healthier, it tastes better and you get more for your dollar when you buy organic. Try a taste test, get organic carrots and conventional carrots and see for yourself. Better yet, grow your own vegetables, beans and berries! Stop mowing the lawn and start growing your own food! Gardening is a great way to get exercise, fresh air and ‘free food’. For some gardening can be a spiritual practice, a way of connecting to the web of life. Getting your hands in the dirt is a health building activity that’s good for people of all ages. My husband and I have met so many people in the Berkshire happy to share their land, sometimes in exchange for some of the produce that they don’t have time to grow themselves. There are community gardens and plenty of empty lawns, so if you don’t have land, just ask around. 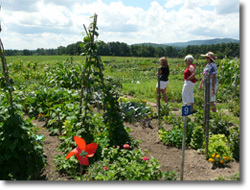 Last year Dana and I saved over $200 a month from June to January by growing our own food at a friend’s farm. And the best part was that we were eating even more veggies than we would if we had to buy them from the store! Once you are growing your own food you can preserve it by canning, drying, freezing or lacto fermenting. If you don’t know how, I’m sure you know someone who does. Try organizing an end of season canning party! Get together with your friends and neighbors and teach your kids. The more you do for yourself the less you need to buy. One last tip: I know that grocery shopping often can include things like paper towels and products for all manner of things we don’t always actually need. And these things add up. What do you really need and what can you replace with reusable items? I haven’t bought paper towels or paper napkins in years. I have a stack of kitchen towels and I use them for everything. Use a mason jar or reuse take out containers instead of plastic wrap and plastic bags. A roll of plastic wrap is destined for the land fill: think about where the things you are buying are ultimately going to end up. 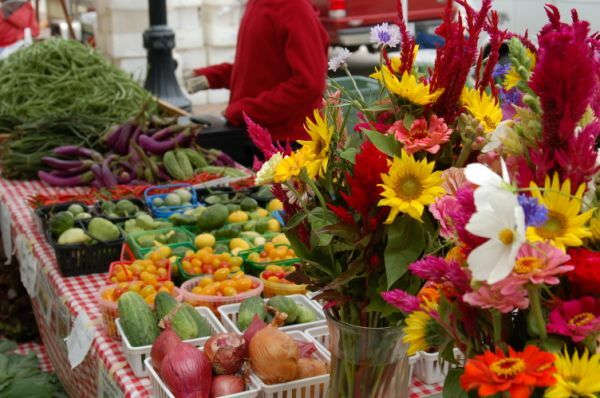 Think long-term and about how you can invest in your health, the health of your family and your community: when you buy local products, locally raised veggies, meat and cheeses you are getting the best food on earth. 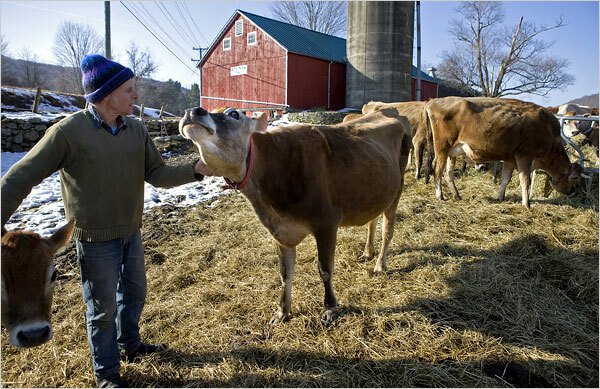 Plus, local shopping means your money stays in the Berkshires; it goes to the farmer and the shop owner: your friends and neighbors. When you shop at Price Chopper your dollars go to corporate headquarters…somewhere. Think about the environmental impact of your food choices, was it trucked in from California, that’s a lot of diesel fuel. When you make this paradigm shift, when value is so much more than just dollars, you are cultivating much more than your own health- you are making choices that positively affect everyone around you.